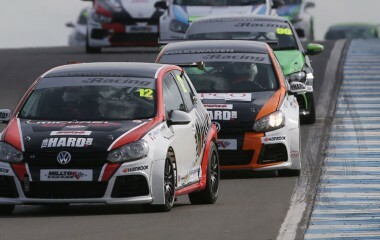 The 16th season of competition for the UK’s best-supported single-make saloon series, the Volkswagen Racing Cup, provided a customary mix of on-track excitement and down-to-the-wire drama with, yet again, a packed grid for most events as well as a further step forward in terms of competitiveness and outright speed. 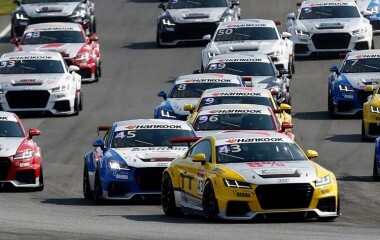 Lap records tumbled at nearly every circuit that the Milltek Sport-backed championship visited and, with no fewer than nine different winners over the course of the 16-race series, there was an air of unpredictability all year long. There was an unpredictable champion, too, in the shape of Aaron Mason, who won only one race all year and who did not really come into the frame until the final meeting. 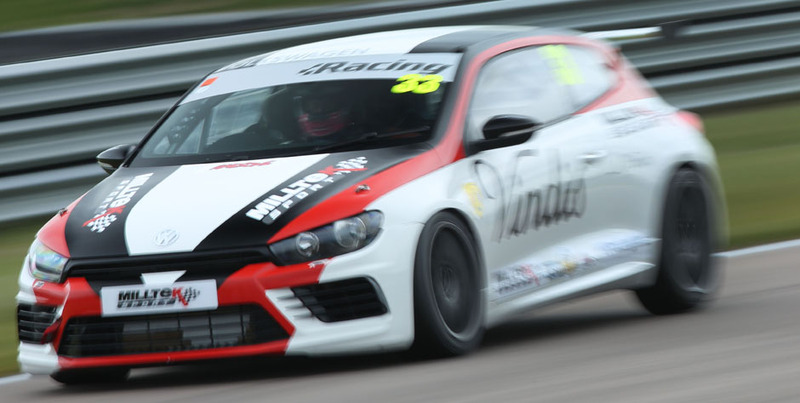 Up until then, everything looked to be going the way of David Sutton who, in this third season of VW Cup competition and with one of SlideSports’ potent Scirocco Rs under him, tasted more victory champagne than most. David got his campaign underway in fine style at Oulton Park in April, winning two of the three races and claiming second place in the other… Oulton’s Easter event was the first to feature a three-race format and was judged a huge success. Sutton notched up a further victory in the first of the three Rockingham races, and a fourth win at Silverstone to amass a healthy points lead which carried him in the championship lead all the way to Donington Park in September, despite no further podium finishes for the Rotherham racer. 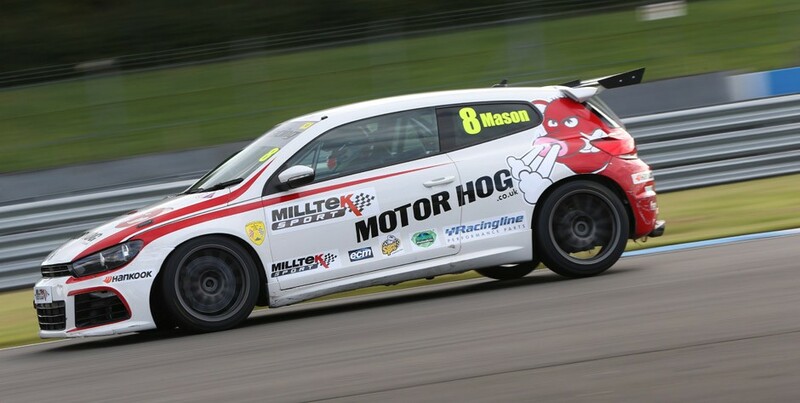 AWM Scirocco driver Mason struggled to regain the form which netted him the 2013 championship title. Second and third place finishes at Oulton and Rockingham were some consolation but it was not until Brands Hatch – following a dismally uncompetitive time at Spa-Francorchamps – that Aaron managed to regain top pace. His 11th-round win was his first (and only) victory of 2015, and the 21st of his seven-season VW Cup career. Mason went into the final meeting as one of five drivers with a title chance, and trailing Sutton on points. The first Donington race brought disaster for both men, with both punted off the track (in separate incidents). Sutton failed to finish but Mason was able to limp home eighth, a position he was able to achieve for a second time in the final, double-length race. Sutton battled through to 12th in his battle-scarred Scirocco but it was not enough to prevent Mason from taking his second championship title. 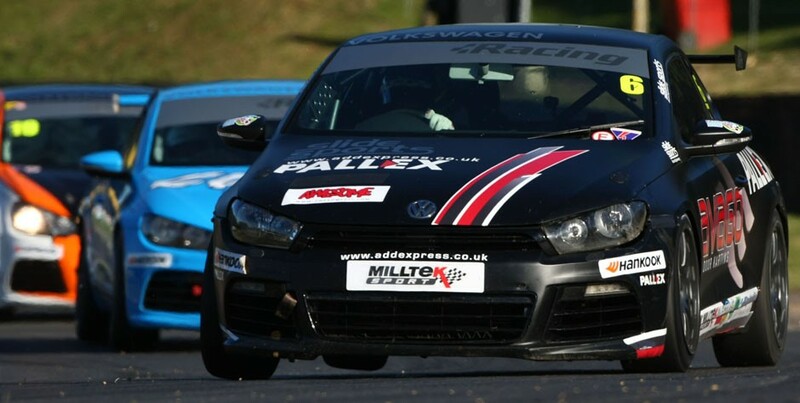 Joe McMillan, who followed up a career-best fifth place in the championship’s opening round at Oulton Park with his first VW Cup win in round two, converting a front-row start to victory despite pressure race-long from Sutton. Jack Walker-Tully, who was another first-time winner, joining his uncle, Richard Walker, and cousin James on the VW Cup victory roster thanks to an impressive double-top at Rockingham, once in the wet and once in dry conditions. 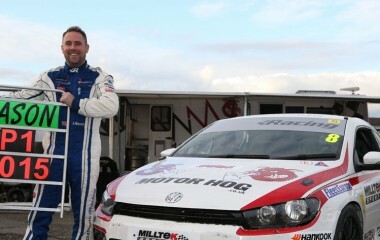 Reigning Champion Joe Fulbrook, who did not enjoy the luckiest of seasons in the Safe and Sound-backed Golf GTI but showed he’d lost none of his magic at the wheel by following up a brace of seconds at Rockingham with a race victory at Silverstone. Team HARD’s Michael Epps, who adapted rapidly to front-wheel-drive saloons from his previous incarnation as a single-seater racer. Michael won for the first time at Spa but was denied a Belgian double when excluded from the results for a technical infringement, the round 10 win instead going to his team-mate Howard Fuller – his only victory of 2015. 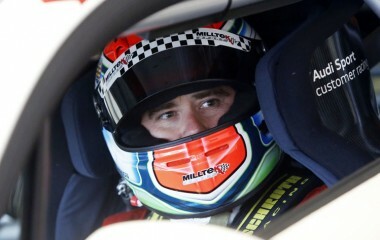 Another win at Brands and a Donington double brought Epps’s tally for the year to four, equalling Sutton’s score. Another Team HARD Golf driver, Bobby Thompson, swept all before him in the first race at Snetterton, with 2004/’05 champion Phil House making a long overdue return to winners’ circle in the other Snetterton race. Lucas Orrock, who ended the year championship runner-up for a second season in a row and who was unlucky not to win a race in his KPM Scirocco. Simon Rudd, who endured a difficult start to his season with Team HARD before finding his wings at Donington for the final meeting. Second place in the final race of the year was an impressive feat. Simon Tomlinson, an excellent 12th overall for the AWM team and a multiple winner during the season of the Sportsman’s Trophy. 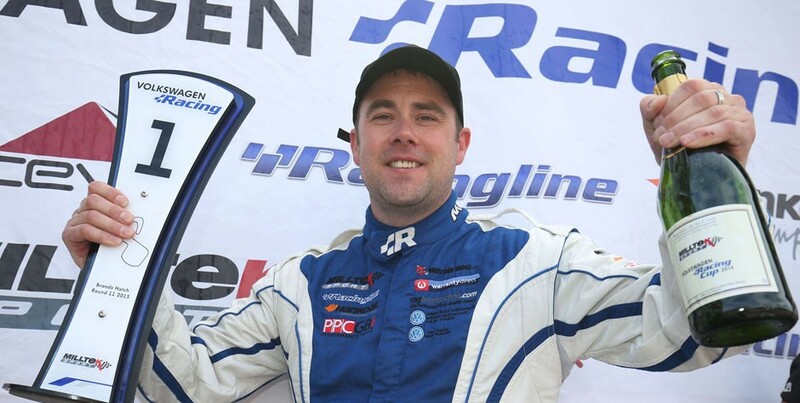 Robert Barrable, who made only sporadic appearances, at first for THM Racing and latterly with Team HARD, scoring podium finishes at Snetterton and Donington. And, completing the championship top 15, two Sportsman’s Trophy winners: Graham Ewing and Philip Morris, both of whom gave their younger rivals a good run for their money.